This time last year, first-year Emory Law student Nicole Schladt was spending her spare time Skyping with United Nations officials around the globe. The conversations would become foundational research for her master's thesis at the University of Cambridge, examining U.N. discourse on Sexual Orientation and Gender Identity (SOGI) — specifically, resolutions passed by the U.N. Human Rights Council in 2011 and 2014. Today, Schladt can see how that experience fits with all the other pieces of her academic journey, as she looks toward a career that will eventually combine her interests in human rights, gender issues and international politics. But as an undergraduate at the University of Kentucky, that path wasn't so clear. Schladt knew that she wanted to do something within a broad international sphere; she just wasn't sure exactly how she would get there. So she cast a wide net, exploring journalism, politics, Latin American studies, and gender and women's studies — academic forays that always allowed her to keep a firm toehold in the humanities, which was important to her. In her spare time, Schladt sampled much of what the university had to offer, serving as president of the University of Kentucky Women's Choir and editor-in-chief of The Colonel, a satirical campus publication; participating in policy debates; coaching an all-female a cappella group through national competition; and helping found an all-female bluegrass band, Blue Moon Shiners. Mostly, she wondered how her diverse interests could possibly fit together. Looking back, Schladt acknowledges that it may sound like a scattershot approach to finding her academic path, but she has absolutely no regrets about how it has fallen into place. Part of her interests were deeply embedded in music. For a senior thesis on female banjo players, she learned to play the banjo and formed an all-female bluegrass group. An interest in journalism and world affairs also pulled her toward international studies. But it was an elective class that would prove a game-changer. "I took a gender and women's studies course because it fit my schedule and I really fell in love with it," she recalls, eventually choosing that focus. Over time, the Lexington native decided to pursue a double major in gender and women's studies and international studies. When the possibility of law school beckoned, she began applying to top programs. Yet by the end of her senior year, Schladt was feeling adrift and uncertain, contemplating a gap year to help solidify her options. "My senior year was really tumultuous," she acknowledges. "I had no idea what I wanted to do." Amid a packed schedule, Schladt says she forgot that she'd applied to a master's degree program at the University of Cambridge during her junior year. "I had been at Oxford the summer of my sophomore year through a scholarship and really enjoyed studying in England," she says. When an acceptance letter arrived from Cambridge, "everything kind of fell into place." But another letter arrived, too — an acceptance letter from the Emory School of Law, along with the offer of a Woodruff Fellowship. Faced with two "fantastic" opportunities, Schladt asked if Emory would be willing to allow her to defer for one year. "It really worked out," she says. "At the beginning of my senior year, I had no idea that I would end up at both Cambridge and Emory Law School. It was almost too good to be true." At Cambridge, Schladt pursued a master of philosophy degree in international relations and politics, "an intense, accelerated program that was the culmination of everything I was interested in," she says. For her research topic, she chose a "trans*" critique of U.N. policies, specifically, two non-binding resolutions that address sexual orientation and gender identity. "I wanted to look at which nations are actually listening to what the U.N. has to say," Schladt says. "In feminist theory, queer theory is a big branch that argues we have to challenge assumptions of how we talk about things," she explains. "Many queer theorists would argue that fixed categories of gender and sexuality are bad, calling yourself 'gay' may mean different things to different people. Trans* theory would argue that such categories can actually be meaningful." "I took that approach looking at the U.N. resolutions — looking at rhetoric, word choice and how people were implementing it on the ground," she adds. The work found her interviewing U.N. officials in The Hague, New York City and field offices around the world to discuss how SOGI policies were working. In the end, she found people in different cultures perceived the resolution text quite differently. "The words 'gay' and 'lesbian' don't mean much in some countries, but in others they can have negative repercussions and people may not identify with them," she says. Her conclusion? "It's important for people to think more critically of the texts," Schladt says. "The SOGI resolutions were considered historic — the first time people were even discussing these topics on the floor of the U.N. The rhetoric is important, and it is questionable to impose categories on people that may not identify with them. That doesn't protect people from discrimination." This fall, Schladt was delighted to see another piece of her academic puzzle fall into place, launching her studies at Emory Law. "People need advocates and one of the most effective ways to advocate for people is through the law," she says. 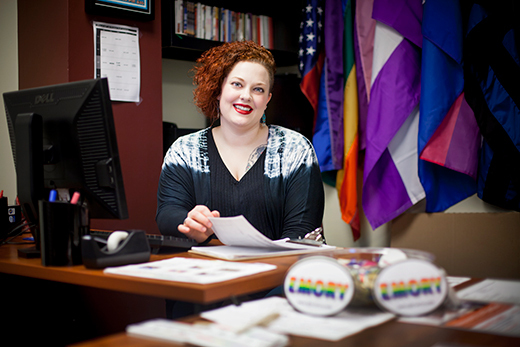 Outside of class, Schladt serves as the graduate assistant for Emory's Office of LGBT Life. This summer, she has plans to work with Lambda Legal, a national organization dedicated to supporting the civil rights of LGBT citizens through education, litigation and public policy work. As for the future, she definitely wants to practice law, but there's always the possibility of pursuing a PhD. And friends tell her she needs to run for political office. Schladt rules out none of it. "It's how I felt my senior year and I think it's the story of my life," she laughs. "I try to keep myself open to all the possibilities I can."